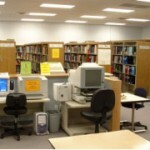 The Iowa Genealogical Society library is available to the public. There is a non-member daily usage fee of $10.00 or a yearly individual membership is $35.00 and a family membership is $45.00. The extensive collection of books, microforms, and periodicals in addition to Iowa materials includes materials for many other states. The traditional resources within the library include our 20,000 volumes and 15,000 microforms covering the United States as well as many other countries. These vital records, histories, federal and state census records, military records, and other information combined with our extensive family history collection provide you, the researcher, with an abundance of sources—many are one of a kind. Our state-of-the-art facility integrates technology with traditional research. Library layout map. A bank of computers has high speed internet access. A wireless network allows researchers to use their laptop computers or PDA’s to access the internet from anywhere in the facility. A digital reader-printer gives the ability to scan microfilm images direct to CD-ROM. Our knowledgeable librarians and volunteers will help you get started. Later, call on their years of experience when you need help with those brick walls. This is help you won’t readily find on the internet. Need assistance in a specific Iowa county? Call on our network of local county chapters. Unable to visit the library yourself? We offer research services for a very reasonable hourly rate. Let our experts do the work for you! Genealogists thrive when they’re surrounded with others whose eyes don’t glaze over at the mention of census records! Our Fall Annual Conference provide the perfect opportunity to network with others, learn from nationally known speakers, shop our vendor area, and just plain have fun! The Spring Technology Conference theme is technology and how genealogists can use it. We publish over 2,000 soft cover books covering a wide variety of records compiled by our county chapters. A catalog is available online or in print. We publish a newsletter filled with IGS news, pictures, and interesting info. Our journal, the Hawkeye Heritage, covers Iowa and other research topics in more depth. Classes covering a variety of research topics, exhibits at a variety of venues, and our popular speakers bureau are all methods we use to educate the public and entice those hesitant beginners to start tracing their family tree. We offer three certificates suitable for framing to honor your early Iowa ancestor— the Statehood, for those in Iowa by 1846; the Pioneer, for those in Iowa by 1856; and the Century, for those whose ancestors settled in Iowa 100 years ago. Certificate information is on file in the library and an index is online. 628 E Grand Ave, Des Moines, Iowa 50309-1924. Located in the East Village section of the downtown area. We are two blocks west of the State Capitol Building and directly across the street from the Iowa State Historical Building. The Library can be reached by taking Interstate 235 and exiting on NE 14th St. traveling south to Grand Ave. and turning west for 8 blocks. During freeway construction, please drive carefully. Free parking is available in front of the library. A state parking garage is located adjacent to our building. There is metered parking on the street in front of the facility. 628 East Grand Avenue is fully handicapped accessible. There is a lunchroom in the facility. Vending machines, refrigerator, and microwave are provided for all persons to use. Numerous restaurants are located within walking distance of our address. Food and drink are not allowed in the Library. All patrons are asked to sign a register upon entering, and are free to come and go throughout the day. All briefcases and tote bags are to be stored in lockers inside the front door. Cell phones may be used in the entrance hallway out of respect for other researchers in the Library. Non-IGS members are required to pay an $10.00 per day usage fee, unless prior arrangements are made for a group visit. The Library has available fifteen microfilm readers, a microfiche reader, and four computers for use by patrons, as well as a copier and two microform reader-printers. High-speed internet access is also available for genealogical research use only. With our new I-Spot connection The price per copy on the copier, reader-printer, and from the computer printer is 25 cents. Monday, Wednesday, Friday, and Saturday from 10 a.m. to 4 p.m.
Tuesday and Thursday from 10 a.m. to 9 p.m.